The Republic of Namibia is a country in southern Africa whose western border is the Atlantic Ocean. It is bordered by Angola and Zambia to the north, Botswana to the east and South Africa to the south and east. Namibia has an area of 825,418 km2 (318,696 sq mi) and a population estimated in 2009 at 2,108,665. Namibia were inhabited from early times by Bushmen, Damara, Namaqua, and since about the 14th century by immigrating Bantu who came with the Bantu expansion from central Africa. Namibia was not extensively explored by Europeans until the 19th century, when traders and settlers arrived, principally from Germany and Sweden. Namibia became a German colony in 1884, known as German South-West Africa. South Africa occupied the territory in 1915. Independence from South Africa was gained on 21 March 1990, following the Namibian War of Independence. The Ovambo, a Bantu ethnic group, form about half of the population, residing mainly in the north of the country. Other ethnic groups are the Herero and Himba people, who speak a similar language, and the Damara, who are ethnically also of Bantu origin but speak the same "click" language as the Nama. In addition to the Bantu majority, there are large groups of Khoisan (such as Nama and Bushmen), descendants of the original inhabitants of Southern Africa. The country also contains some descendants of refugees from Angola. There are also two smaller groups of people with mixed racial origins, called "Coloureds" and "Basters", who together make up 6.5% of the population. There is a large Chinese minority in Namibia. Whites of Portuguese, Dutch, German, British and French ancestry make up about 7% of the population. At least 80 percent of Namibian citizens identify themselves as Christian. The largest Christian group is the Lutheran church, divided into three denominations, comprising approximately 50% of the population. Other Christians comprise 30% of the population, including Roman Catholics, Anglicans, Baptists, and Methodists. Sects include the Church of Jesus Christ of Latter-day Saints (Mormons), New Apostolic Church, Seventh-day Adventist Church, Branhamism, and a number of Zionist Churches (a mixture of traditional African beliefs and Pentecostal Christianity). The Dutch Reformed Church of Namibia is predominantly made up of members of the Afrikaner ethnic group. The Himba and San ethnic groups comprise less than 1 percent and 3 percent respectively and practice indigenous religions. Other religions practiced in the country include Judaism, Islam, Buddhism, and the Baha'i Faith, mostly composed of immigrants. There are few atheists in the country. Muslims in Namibia are almost exclusively Sunni and comprise approximately 3% of the population. Pedro Moussongela, an Angolan Mennonite who spent time as a refugee in Kinshasa in the 1960s and 1970s, is the founder of the Evangelical Church of Mennonite Brethren in Namibia. He, along with Jules Makisa, both from the Evangelical Mennonite Brethren Church in Angola (IEIMA), went to Namibia in late 1998. They began holding evangelistic meetings in the Ondongwa/Oshakati area. In the course of these meetings they met two women who were involved with a church called “Mission Work for Jesus.” The women were favourably impressed by the preaching of the Angolans, and invited the two men to lead their small group of followers in forming a new church. While Makisa eventually returned to Angola, Moussongela continued on as the leader of the Namibian church. The church has developed a preschool, orphanage, and primary school. Training for leaders was started in 1999, and this developed into a Bible School in April 2000. Soon several small "house-groups" were established in northern Namibia. In 1999 work was begun in a large refugee camp near the capital of Windhoek, and eventually evangelistic work was started in Windhoek itself. In 2001 there were about 200 members of the church plus 300-400 refugees in the Windhoek area who relate to the Evangelical Church of Mennonite Brethren in Namibia. "Background Material on Mennonite, Brethren in Christ and Related Churches in Africa and the Countries where they are Found." 2001? Web. 16 April 2011. http://www.mwc-cmm.org/MWC/Material/WFSbackground.pdf. Pedro, Lutiniko Landu Miguel. "Mennonites and Peace-Building in Angola." In Freedom’s Distant Shores: American Protestants and Post-Colonial Alliances with Africa, edited by R. Drew Smith. Waco, TX: Baylor University Press, 2006: 134-135. Wikipedia. "Namibia." Web. 16 April 2011. http://en.wikipedia.org/wiki/Namibia. Wikipedia. "Religion in Namibia." Web. 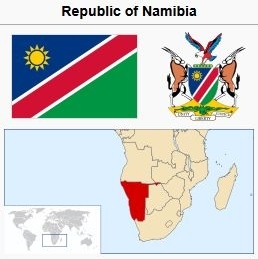 16 April 2011. http://en.wikipedia.org/wiki/Religion_in_Namibia. Thiessen, Richard D. "Namibia." Global Anabaptist Mennonite Encyclopedia Online. April 2011. Web. 18 Apr 2019. http://gameo.org/index.php?title=Namibia&oldid=131857. Thiessen, Richard D. (April 2011). Namibia. Global Anabaptist Mennonite Encyclopedia Online. Retrieved 18 April 2019, from http://gameo.org/index.php?title=Namibia&oldid=131857. This page was last modified on 5 May 2015, at 15:00.